SPECIAL for any available nights in April or May 2019 now $575 per night! SPECIAL for any available nights in April or May 2019 now $625 per night! 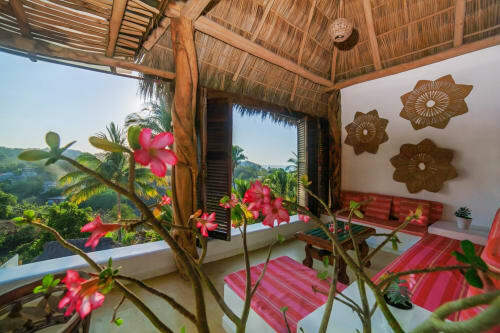 Villa Painted Ponies in Sayulita is an exquisite luxury home with over 6000 sq feet of the very finest Mexico has to offer in the tranquil north side of Sayulita and only a 3 minute walk to the beach, 8 minute stroll to town, restaurants, shops and bars. Elevated over a sprawling canopy of palm trees, the villa offers breathtaking 180 degree views of the ocean and stunning sunsets. The entire property has a water purification system. 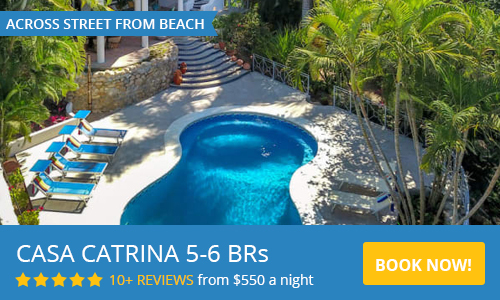 Pool and jacuzzi are heated and not many homes in Sayulita are and its a must in winter months to be enjoyable.Fully gated and sercuritized with wifi throughout and is available as a 3 or 4 bedroom vacation property. LOCATION: The Villa is close enough to everything Sayulita has to offer but just far enough away from the towns vibrant nightlife to offer you tranquility when you want it! We are an easy walk to anywhere you want to go. GREAT ROOM: This is the heart of the villa with the massive old Mexican bar with built in wine/cerveza fridge and full size purified ice-maker and dishwasher. Loads of comfortable seating and a dining table that seats 10. Beautiful artwork and furnishings custom made for Villa Painted Ponies. You will definitely feel the Mexican fibe here but the modern conveniences as well. This entire great room overlooks the incredible ocean views, perfect for sunsets and whale watching. The HEATED Pool/Jacuzzi (a must in the winter months and very few homes have it) is just a few feet away on the same level. POOL / JACUZZI: Heated infinity pool and JacuzziComplete with pool noodles and fluffy towels. A perfect spot for relaxing while working on your tan! There is an additional roof top terrace with a huge palappa roof with a big sectional sofa seating area that is very private for sunrise or sunset. A wonderful retreat for yoga or meditation as well. The built in gas BBQ is right beside the pool area. KITCHEN / BBQ: A chefs dream, this is so much more than a kitchen! Top of the line appliances and miles of granite. Twin sub zero stainless steel fridge and freezer, 2 Italian dishwashers and a maid that comes in 6 days a week to keep it all sparkling clean! Hey if you don't want to cook on your vacation a chef can be arranged. Or if you just want to wake up to a hearty breakfast in paradise the housekeeper can make you an amazing meal. (breakfast and lunch is available for 175 pesos a person per day, dinners 275 pesos.) Bartending services available for 250 pesos per hour minimum 2 hours. Afternoons or evenings! The very large built in gas BBQ is just steps away for grilling the fresh catch of the day or delicious steaks. For el fresco dining a table is right there as well. This area is beside the pool so you won't miss a moment of the fun! DEN/ TV/ ENTERTAINMENT: 46 inch TV with satellite system in an air condictioned spacious room with lots of seating. Also a docking station sound system at the bar for your iPad or iPhone music. Wifi throughout. Local telephone. Some evenings if there is a wedding in town or celebration you will be treated to a fireworks display in full view from every room in the villa! Sayulita is a very authentic Mexican town and almost every evening there is a celebration of the immensely diverse Mexican culture for you to partake in or not! BEDROOMS: All have air conditioning, 4 bedrooms in total, 3 have king size beds one has 2 queens. Each designed as very private master suites with large ensuite full bathrooms with lovely granite and tile. One has a huge soaker tub for 2 with seperate shower. Luxurious imported bedding and private patios with full ocean views. Loads of closet storage and luggage racks setup for your convienience and each bedroom has a personal safe. You will be lulled to sleep in total comfort with the faint sound of crashing waves in the distance. INCLUDED: Maid service 6 days a week, heated pool/Jacuzzi, beach chairs/ umbrellas, cooler, boogie boards. We can arrange your airport transfers in an air conditioned SUV with a stop at the grocery store. In house massages and yoga available. Personal laundry services by the maid for a small tip. Wifi throughout. CHECK IN/ OUT: Our house manager will meet you at the Villa on your arrival and take you through all the workings of the property so you won't waste any holiday time figuring things out. Arrival time is after 3 pm please and departure by 11am. We request a maximum occupancy of 10 people including children. Not suitable for children under 5 years. A shopping and delivery charge of 500 pesos will be added. Menu selections should be made in advance of your arrival. We recently stayed at the painted pony villa and can’t say enough about what a beautiful house this is! The lay out was perfect for us, we had a group of 6 adults and 2 children. Everyone was able to gather together for meals and also have space to do their own thing in different areas of the house. The views were spectacular and we felt very safe. The town is very charming with a lot of fantastic restaurants and shops. Being on the north side it is much quieter so we opted to rent golf carts and spend most evenings over in the city center exploring restaurants and shops. Everyone in town was very nice and again we always felt safe walking around at night. If you want more activity I would definitely recommend a golf cart because walking to the downtown area would be a bit lengthy for most. The home has incredible views because it sits so high up, with that said the hill going up to the house is a steep one! Another reason to utilize the golf cart option :) I would also recommend having at least one meal prepared for you at the villa. We all raved about how amazing our meals were! Carlos was always there if we needed anything, very helpful!! When we arrived I asked if there was a blender. He didn’t think so but honestly I feel like it was within 30min a blender appeared on the counter! He was awesome!! You will not be disappointed with staying at this incredible property!! Great location, amazing views and service! Fun, relaxing and memorable vacation! Painted Ponies is a beautiful home and exceeded my expectations. The flow of the house worked very well for our group. We loved the pool/bar/ hot tub hang out areas as well as the privacy of our individual rooms. Our favorite spot was the beach in front of the home (5-7 minute walk) as it was not over crowded but still had plenty of energy. In the evenings we walked to town for dinner and night life. So many great places to try! Thank you to Janis for her exceptional customer service and helping us with our many questions. Carlos and Arely were extremely friendly and accommodating. We will be back! We loved everything about our stay at Painted Ponies. The villa is gorgeous and was ideally laid out for our 2 family group of 8 adults - everyone had their separate area to retreat to at night and plenty of communal space for relaxing and socializing the rest of the time. The staff was amazing - we were served the most delicious food and amazing drinks, all beautifully presented. The town of Sayulita was a pleasant surprise (much nicer and more interesting than I had expected) and was easy to get to by foot or golf cart from our villa. Note - the hill to the villa is very steep - not an easy walk if you are mobility impaired. I hope to come back here soon - I have had many villa vacations during my lifetime and this one ranks at or near the top. Awesome house and even better staff! We have been renting villas around the world for many years - Painted Ponies is up there with the best of them. 1) Location - perfect - just far enough from the center to me more quiet but still an easy walk to town and two minutes from the beach. Plus you get the best view in Sayulita. 2) The house - great - especially for teenage to adult guests - less so for little kids. The main room with the opening glass wall and bar and dinner area are fantastic for social family time. The rooms are well spread out to give great privacy to all guests. 3) The staff - awesome - Carlos and Arely the chef have the ability to create fantastic meals and cater to every need without being stressed or obtrusive. It’s like they had a magic wand. 4) The owner - the best - Janis was communicative, responsive, very helpful and very fast to return the deposit. 5) Overall - Not sure what to offer as suggestions for improvement. Everything was perfect. This is our 2nd year staying at Painted Ponies, and probably won't be our last. The views are incredible. The layout of the home is perfect which allows for each party to have their privacy if needed. The kitchen appliances are 2nd to none, and the bar in the main room overlooking the ocean is a staple! Carlos is great, and extremely helpful, and Arely is fantastic. She can also make you a meal you will never forget. Absolutely Stunning and Perfect Location!!!! I came to the Villa with my two teenage girls and husband and my sister along with her 3 teenage boys. We couldn't have chosen a better place to stay. I highly recommend staying on the North side of Sayulita -- just far enough away from the hustle and bustle of town but still just a short golf cart ride away. The setting of the Villa was gorgeous!!! We all enjoyed going to the beach during the day and then cooling off in the beautiful infinity pool in the afternoon and watching the sunset each night!! The layout of the home was amazing giving everyone privacy. Carlos and Arley, the house staff were so wonderful and accomodating with helping us with anything we needed. The pictures of the home online were so stunning but walking into the Villa that first night was unbelievable. We will definitely be back. Thank you again to Janis and her staff with providing us with such an incredible home to stay in. Our group of 8 adults stayed at Villa Painted Ponies from February 3-10th. The villa was spectacular, the views amazing. The property is as advertised. From the day we booked to arrival the owner responded promptly to all of or comments and questions. The staff was friendly and more the accommodating for our request throughout the week and Arely prepared a fantastic meal for us on the first night. We would highly recommend having her cook at least one time during your stay. Carlos ensured our pick up to the airport was on time, fixed a small leak in the bathroom and checked both the hot tub and pool regularly. The villa itself is very secure with coded gates for entry and exit and the location was perfect. Located far enough from town to feel the peace and quiet but close enough to walk. We debated renting a golf cart prior to arrival but after one night we decided it was not necessary. Outside of short steep hill from the villa, the rest of the walk into town was flat. We figured the total walk time from the front door to center of town was approximately 15 minutes. The villa owner (Janis) has omitted many fantastic details that you only notice once you arrive. We would highly recommend this rental and plan on returning in 2019. Thank you Janis, Carlos and Arely for making this vacation very special. Such a beautiful home to spend time with family. Villa Painted Ponies was absolutely perfect for our family holiday stay. Our family of 5, 2 adults and 3 children, had such a beautiful stay whilst at Painted Ponies. From the moment we arrived we were in awe by the view, the gorgeous villa, and the homely feel that the villa offers. We would walk to town each morning (10-15 min), and spend the afternoon relaxing by the pool. The villa is just beautiful and so spacious. The beds are very comfortable, the décor is amazing and the kitchen is fantastic. We also made great use of the ice machine, pool and spa. We took advantage of the offer to be picked up from the airport with a stop at a supermarket on the away, it was a great decision. Areli prepared a wonderful meal on our first nights arrival which was delicious and so appreciated after a long day of traveling. Janis, the owner, was always so accommodating and helpful, with very quick responses to all our messages. Sayulita is a beautiful little town which offers a great mix of culture, cuisine, fun and safety. We were even lucky enough to see a turtle release from the beach down the road. A beautiful Villa with an amazing view from every room. From the moment we entered the villa we were never disappointed. We had a party of six we all had are own privacy and never felt crowed. The staff Arely and Carlos are lovely people and truly made everything comfortable for us. We can not wait to come back. We are all ready planning a trip in 2019 and we will be staying at the Villa Painted Ponies. Great villa for a large group! 8 adults stayed here for my best friends wedding at Villa Amor, we we're not dissapointed! The pool and kitchen accomedated our large group perfectly. The views are gorgeous. Carlos went above and beyond! You'll want a golf cart for the steep hill, but the flipside of staying on the north end is the beautiful views and beaches. Miss Sayulita already! Payment can be by PayPal or echeck via PayPal or direct deposit to my bank or by wire transfer. HIGH SEASON : November 1-April 30 $995.00 USD per night entire property - 4 bdrms/4.5 bathrooms, including separate casita with full kitchen. MID SEASON : May 1-31 $795 USD per night 4 bdrms/4.5 bathrooms, including casita - 3 bedrms main villa $725 per night. Includes exclusive use of property. SPECIAL 4 bedrooms all available nights April/May 2019 $625 4 bedrooms $575 3 Bedrooms! PLEASE NOTE: when renting just 3 bedrooms we do not rent the 4 th bedroom to any other people. This room simply remains locked and out of use. Christmas week $1295.00 per night. New Years week $1495.00 per night. 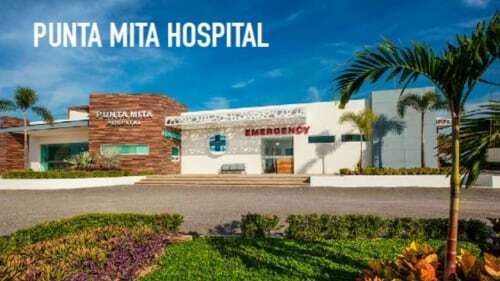 50% deposit to secure reservation balance due 60 days prior to arrival. This is a non-smoking home. Pets are not allowed. Please no guests under 5 years of age. $1000.00 refundable security deposit if property is undamaged. • NO Smoking - anywhere on the property except back garden. • Painted Ponies is not suitable for children under 5 years of age. We built this Villa in 2012. We absoulutly love it and are sure you will too! Please come down for a week and see for yourself.